You can't keep a good (or bad) corpse down, and they rise up in spectacular form in this new collection. The mindless, shambling zombies of yesteryear are rapidly being replaced by sprinters and runners with an insatiable appetite for human flesh. These days zombies are the rock and roll of horror monsters. Presenting a mix of voodoo victims, creepy somnambulists, and flesh eating, rock n roll deadheads, The Mammoth Book of Zombie Comics brings you the best the graveyard can give. 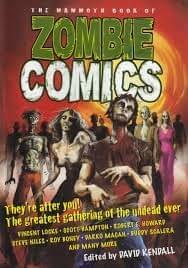 From film sources and literary sources to some very strange sources, here over 20 of the best zombie comics ever produced. They include the first Vince Locke Deadworld comic, Scott Hampton's awesome adaptation of RE Howard's Pigeons From Hell, plus stories from Steve Niles, Darko Macan, and many, many more. If it's dead, moving and hungry, you'll find it here!